North Korea has abruptly recalled its ambassador to Indonesia after a series of events in the Southeast Asian nation about the human rights situation in the North. North Korean Embassy staff last week disrupted seminars organized by South Korean and Indonesian activists in Jakarta, and the South Korean Embassy requested police protection. Another event in Bandung on Friday went ahead without a hitch because of the police presence. The North on Saturday replaced the ambassador, Ri Jong-ryul, with An Kwang-il, sparking speculation that Ri is being held to account for the éclat. 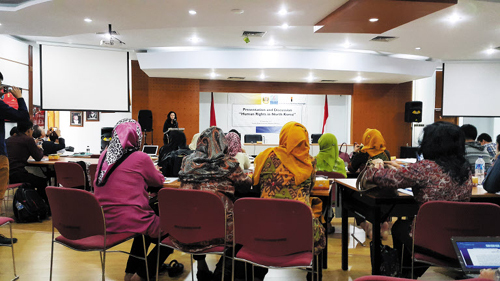 A seminar on North Korean human rights is held at a university in Bandung, Indonesia on Friday. Only a few months ago the North Korean Embassy in Jakarta appeared to be in a festive mood after a memorandum of understanding was signed with Indonesia on scientific and cultural exchange and cooperation between universities, a South Korean Embassy official said. But North Korean Embassy officials were upset when they learned of the seminars jointly organized with the Institute for Policy Research and Advocacy (ELSAM), an Indonesian policy advocacy organization and South Korea's Citizens' Alliance for North Korean Human Rights. The North Korean Embassy also lobbied the Indonesian government to block the seminars, but to no avail. Indonesia is one of a few countries along with China, Cuba, Russia, Sudan and Zimbabwe which have never voted in favor of a UN resolution on North Korean human rights. North Korean regime founder Kim Il-sung visited Indonesia in 1965, establishing a special relationship that has lasted until today. Last year North Korean leader Kim Jong-un sent a personal letter to Indonesian President Joko Widodo on his election and invited him to Pyongyang. But the Indonesian government has been less than enthusiastic recently, especially since Marzuki Darusman, a former Indonesian prosecutor general, is now the UN special rapporteur on human rights in the North, and Indonesian activists have condemned human rights abuses in the North. Kim Suk-woo, a former vice unification minister and adviser to the South Korean activists, said, "The North is reacting sensitively because it's well aware of the consequences that would ensue if Indonesia casts a yes vote in a UN resolution on North Korean human rights."